As the season just starts to change from late spring into early summer in the land of Feierabriand, a shy, slightly fey young girl from the village of Minas Ford is up in the hills gathering healing herbs when the first of the mighty griffins wing overhead, the air turning hot and arid in its wake. Soon the sky is full of the gorgeous but deadly creatures and Kes watches in awe until they disappear beyond the mountain. Their arrival heralds a change on the wind that will shake Feieraband down to its foundations, strip the earth from Kes' blood and replace it with fire, and bring war to a kingdom. In Lord of the Changing Winds, we're introduced to the young and painfully shy Kes, the powerful and proud griffin mage Kairaithin, and the idealistic and honorable human Betraud, Lord of the Delta and right hand to King Iaor of Feierabiand. The fate of their corner of the world rests on those three sets of shoulders and they, along with a handful of others, inhabit the pages of this book with ferocious presence, dedication, and a will to triumph that is as epic and thrilling as it is delicate and complex. It was the idea of griffins, a mythological creature that I favor but one that isn't over populated in the fantasy and urban fantasy genres, that drew me to this book when I stumbled across it on Amazon.com and I've rarely been happier that I gave a book a chance. Rachel Neumeier has created a breathtaking world and breathed fiery life into the landscape of this first book in the Griffin Mage Trilogy, with a complex and layered plot full of eddies and currents that are as changeable as the very winds the griffins command. I was tremendously impressed with the originality of the mythos and dedication to character definition that brought such fantastic color to this world, creating a griffin culture and individuals that are utterly unique. I thoroughly enjoyed Neumeier's creation of that species and admire how adeptly she kept that species decidedly other than human in a very believable and fantastic way while keeping their plight sympathetic despite the fact that the majority of griffins as individuals were anything but. In fact, this book is richly populated with groups and people who aren't really all that nice in any sort of heroic sense, and their own agendas and prejudices often pit them against each other. What's compelling about that is how utterly believable and realistic that is considering the cynical world we live in. The fifteen year old Kes is by far the most innocent of the characters and still through the course of the book that innocence transmutes to something otherworldly. I loved her journey, and I loved Bertaud's growth and development. I admired the way Neumeier was able to allow us glimpses into the hearts and minds of griffins. I thought the concept and plot of this opening gambit into the series was well paced and complex enough to maintain my interest, though I was more interested in the griffins than in the kingdom politics, especially at first. Those two aspects of the plot came together quite nicely further into the book, though, so I was happy. I think the narrative had a nice flow, and I have little criticism for the way Neumeier tells her story. There were just a few minor issues that didn't detract from my admiration of the book as a whole, but did prevent a full five star rating. When introducing the griffins to the reader through Kes' eyes and mind, I was a bit overwhelmed by their names. Perhaps it's ridiculous, but when I come across a word or name that would be difficult to pronounce, it pulls me right out of the story and I sit there for long minutes working it out - that's not something I do consciously, and it's one of the reasons I used to avoid anything dealing with the Fae because those Gaelic names are killers. I know it's not an issue everyone has, but it definitely puts a cog in my wheel when I'm reading, and the griffin's names seemed like a cross between Native American and Japanese so I had some trouble with them, especially given how long the full names were and how often they were used in full. Eventually, I just focused on their familiar names. I also felt that the author relied a little too heavily on repetition when setting the griffins apart from humanity in thought and deed in the beginning. I read over and over how this expression or that action wasn't as a human would feel it, do it, express it, or say it, seemingly for each emotion and action of each griffin, at first. More than once I thought to myself that I'd gotten the point that these creatures were definitely beyond the ken of human sensibilities and cultural mores and didn't need the constant reminders. I think readers would've been fine with more subtle reminders periodically through the length of the story. On a personal level, there was one thing about this book that didn't set very well with me. I felt very odd about the direction of Kes' personality towards the end of the book and ended up feeling a little short changed and unhappy where she ended up in her development. I liked her character so much that I felt her absence in the last couple of chapters quite keenly, and when she returned to the focus she was so utterly unrecognizable that I almost felt as bereft as her sister seemed to. And to be honest, I'm not sure that's something that I can criticize the author for, because by that time, I'd definitely gotten the hint that griffins are not human and neither by then was Kes so the fact that the disconnect was felt so keenly for me as a reader, but maybe that meant the author did a truly brilliant job with her character and the story... If so, who am I to complain? Still, it wasn't the sort of goodbye I would've preferred and that, along with the other minor issues, is what prompted me to keep the rating of Lord of the Changing Winds just shy of a full five. Of course, that being said, I did quickly download the second in the trilogy, Land of the Burning Sands, and would strongly recommend you do, too. 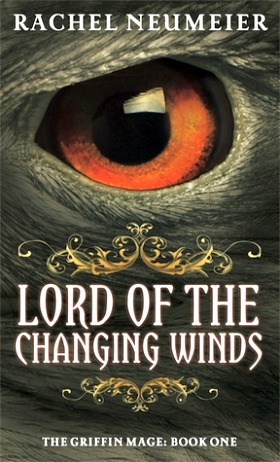 Lord of the Changing Winds was a fantastical foray into a breathtaking world and I can't wait to read more.